Discussion in 'Lets Talk about gambling and more...' started by Marina, Aug 14, 2014. Everyone enjoys a good card trick, especially when the action slows down at a casino card table. Have you ever seen someone guess the card in your hand and chalked it up to magic? impressing everyone at your poker table (and who doesn’t secretly enjoy impressing everyone at the poker table? 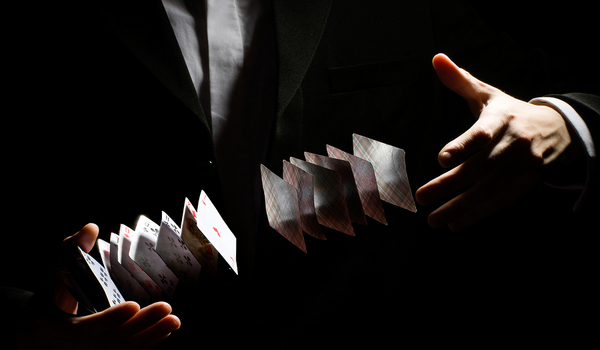 ), you may want to take a look at the easy, effective card tricks below. If you do not own a black hat, bunny rabbit, or wand, there is no need to fear. These tricks are so easy that anyone (yes, even you) can pull them off. If you are looking for a trick that really takes the cake for best presentation, you might want to try this one. In this card trick, an individual removes a random card and holds it in his or her palm. He or she then awes all spectators by levitating it. Of course, this is a card trick, so you can be sure that the card is not really random nor is the levitation a telepathic feat worth writing home about. Gather a deck of cards, a flexible plastic strip (like the annoying ones manufacturers attach to wide necked shirts), scissors, and clear adhesive tape. Work your magic on the cards ahead of time. Secure the aforementioned plastic strip to the back of a playing card. We know you hate those weird shirt “hanger-upper” things anyway. Here is the perfect opportunity for you to get your revenge. Grab some scissors from your desk drawer and snip the plastic strip off of a clothing article. Tada! The perfect card gimmick. By lightly pressing on each end of the plastic strip, the desired card will arch upward and you will easily be able to find it time and time again. Pull card upward by invisible plastic “string.” Smile smugly as you levitate your first card. Tip: be sure and practice this trick in front of a mirror repeatedly until you get the angle just right. When it comes to card tricks, angles are everything. Nothing says magical like a mind reading card trick. To perform this trick, you will allow the spectator to choose a card and then shuffle it back into the deck. As the spectator looks at his or her card to memorize it, pretend you are someone sneaky (like Tom Cruise in that one movie) and very subtly look at the bottom of the deck. Memorize the card that is on the bottom of the deck. Make a show of not looking at the spectator’s card as he or she places it at the very bottom of the deck – right next to the card you just memorized. Cut and shuffle the deck as many times as you want. All that matters is that those two cards stay right next to each other. When the time comes to reveal the card, simply look through the deck for the card you memorized. The spectator’s card will be the one right after. Pick up a full deck of 52 cards. Throw said deck into the air with a flourish and let all of the cards fall to the floor. Make a break for it before someone makes you clean up your own mess. newfound magic tricks to your buddies. They ought to get a big kick out of the ordeal, and (let’s be honest) you will probably enjoy the attention. This presentation of simple card tricks was intentionally somewhat silly; however, there are many in-depth card tricks out there that take a masterful hand and a keen eye. or any other knowledge-packed resource. You can do anything you put your mind to - even magic. Whhoohoo I should give this a try! I love card tricks! Some really good tricks! Thank you very much for the great article!